Equally at home in economic theory and political philosophy, John Roemer has written a unique book that critiques economists’ conceptions of justice from a philosophical perspective and philosophical theories of distributive justice from an economic one. He unites the economist’s skill in constructing precise, axiomatic models with the philosopher’s in exploring the assumptions of those models. His synthesis will enable philosophers and economists to engage each other’s ideas more fruitfully. Roemer first shows how economists’ understanding of the fairness of various resource allocation mechanisms can be enriched. He extends the economic theory of social choice to show how individual preferences can be aggregated into social preferences over various alternatives. He critiques the standard applications of axiomatic bargaining theory to distributive justice, showing that they ignore information on available resources and preference orderings. He puts these variables in the models, which enable him to generate resource allocation mechanisms that are more consonant with our intuitions about distributive justice. He then critiques economists’ theories of utilitarianism and examines the question of the optimal population size in a world of finite resources. 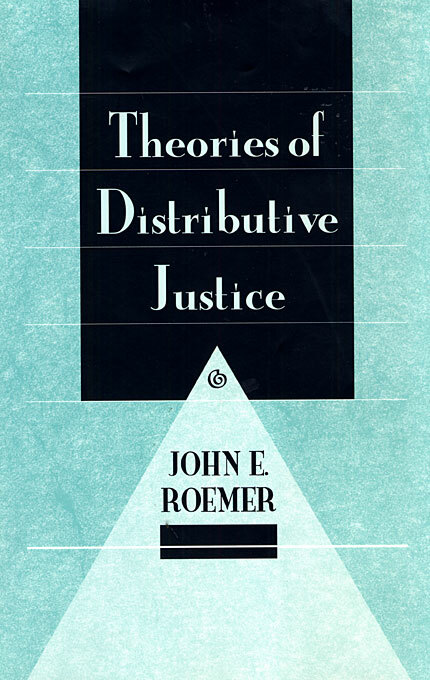 Roemer explores the major new philosophical concepts of the theory of distributive justice—primary goods, functionings and capability, responsibility in its various forms, procedural versus outcome justice, midfare—and shows how they can be sharpened and clarified with the aid of economic analysis. He critiques and extends the ideas of major contemporary theories of distributive justice, including those of Rawls, Sen, Nozick, and Dworkin. Beginning from the recent theories of Arneson and G. A. Cohen, he constructs a theory of equality of opportunity. Theories of Distributive Justice contains important and original results, and it can also be used as a graduate-level text in economics and philosophy.